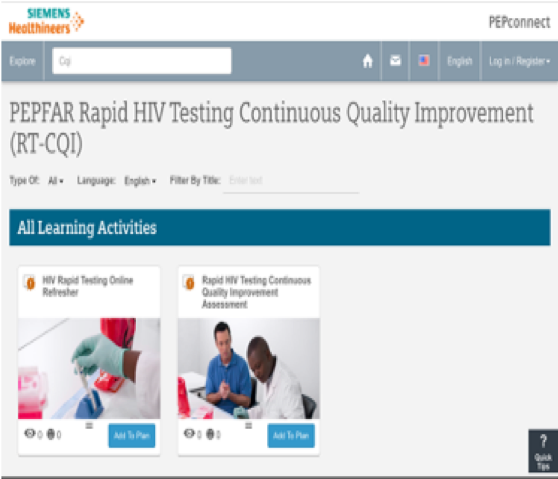 Rapid Testing Continuous Quality Improvement (RTCQI) training video and competency assessment tool is available on a free virtual education platform PEPconnect to assist ministries, health-care providers, and stakeholders in planning, implementing and sustaining quality assurance for point of care testing (POCT). Critical for the first 90, this platform is developed by Stronger Together PPP between Siemens Healthineers and PEPFAR providing personalized education and performance experience for the healthcare personnel to increase staff competency, efficiency, productivity and healthcare outcomes. Combined scores of competency assessments and hands-on practicals allow HIV testers to be certified by WHO certification standards.